Disc fixed on the stem with two pins without Chink to prevent the disc shaken. DBV butterfly valve adopts such design of stepped shaft with the gland. It is effectively that prevent the stem blows out from the top. The Rasied Face is the most common type used in process plant applications. gasket material Including:FF-flat face, RF-raised face, RJ-ring joint and so on. As one of the top valve manufacturer in china, DBV( standing Design, Build, Verify ) provide the world international customers OEM for years. DBV insist on implementing the management ideal “customer first, strict quality, technology innovation”, make efforts on developing the core of the most cutting-edge technology, provide sustainable product solution and service support to customers, to ensure the efficient protection of the customer’s economic interest. 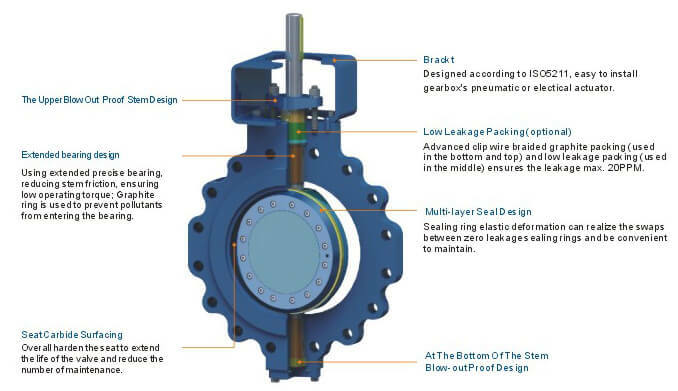 DBV own endless potential to develop more high-end products, and fully invests into the continuous technology innovation and qualified service, committed to become one of the best professional, the most comprehensive and the most reliable valve enterprises. You are welcome to visit us freely, inspect and verify us any time.